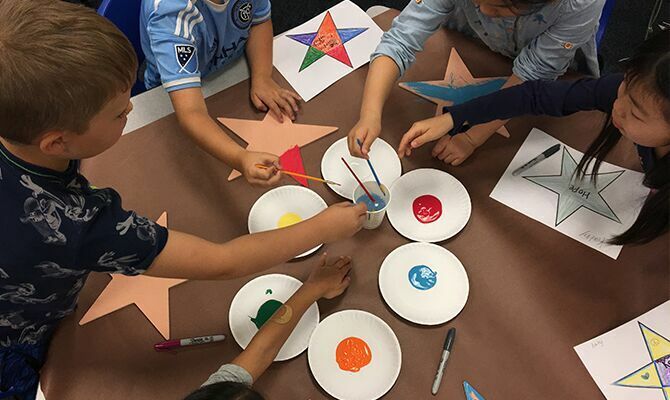 Stars of HOPE had the privilege to partner with 200 second and third-grade students at the United Nations International School in New York City to create hope for children in Syria. The students painted inspirational messages on Stars of HOPE which will be placed at the Syrian border in an effort to raise funds for the International Rescue Committee, a humanitarian relief organization providing life-saving care for Syrian children caught up in the conflict. Teachers at the UNIS school brainstormed with their young students in small groups asking the question “Who needs hope?” Their answers were very thoughtful. “People who live in a war zone.” “Refugees.” “Children who can’t go to school.” “People who have to start a new life” and much better thought out answers. The international background of the young students and discussions with their teachers made their answers well informed and inspiring. The morning of the event all the students gathered in the cafeteria. They learned how every child can make a difference in the world through a presentation by Jeff Parness. They saw other children around the world making and holding stars. The students pre-designed their stars and messages on paper to prepare for the morning painting. When we got there they were ready to go! We can’t wait to place these Stars of HOPE at the Syrian border in our joint effort with these young students to show the world that love is stronger than hate.